Are You Exercising On P3? I exercised in every P3 pretty much BUT I can tell you that it can make the process of stabilizing using the scale as your indicator frustrating and nerve wracking. As a result, many choose to forgo exercise until Phase 4 begins. It’s a personal decision. Am I so keen on exercising that I am willing to deal with the disturbing mental thoughts I will experience during this time and troubleshoot P3 if necessary? Is achieving a stable weight and dealing with the least amount of mental stress possible what is most important to me? It’s up to you – ultimately, Phase 3 is not for very long – just three more weeks of your life. So for some, waiting and being able to eliminate one huge factor that causes scale and measurement issues may be what’s best for them. For me, I felt strongly enough about wanting to work out that I did so on all 4 of my successful rounds. And yes, I had many days of discomfort and having to make decisions – do I do a steak day? Do I do one AGAIN today? I’ll describe my own experience with that in a little more detail in a minute. There are many factors that come into play, like if you’ve been exercising prior to the start of your round and now getting back to it, or if this is your first time in a long time really starting an exercise program, and also what type of exercise you’re doing, and the duration. Depending on how de-conditioned you are, there will be more or less water retention when you first get back into it. Basically what happens is when you work out, and you get sore, your body is breaking down muscle tissue and rebuilding it stronger and better. In order to do this, it surrounds the muscle tissue with water while it’s repairing it. This is how the body builds muscle – when you workout, you get a bunch of tiny tears in your muscle, then after the workout your body rushes to the scene to rebuild them, but better and stronger this time. It’s extremely common for people (unrelated to hCG) to complain of weight gain after an exercise program begins. This is why. It all evens out in the end, but since the scale can’t tell you any of this stuff, it can definitely freak you out. This is a great article on How Muscles Store Water after a Workout – notable in it is the fact that trained muscles store quite a bit more glycogen than untrained muscles – so if you have been working out consistently prior to your last round of hCG, it’s very possible that as you get back into working out 3-6 weeks later, your muscles will store more water more quickly, giving the appearance of more weight gain in P3 than someone else. As an example of how disconcerting this can be, on more than one occasion when we’ve done something crazy like 300 sit ups at crossfit or something, and my abs are so sore I can barely stand up straight, my ab area will feel all squishy and thick – like way more than normal – and of course the first thought is like, OMGoodness what’s going on? I ate good, did sit ups, and now my waist is at least an inch bigger?? The answer of course is this water retention going on – the effect is temporary. Once my body has healed that sore area of my body, the “swelling” if you will disappears in a day or two and I feel normal again. But it never ceases to freak me out just a little. So the question is, if you choose to exercise in P3, how do you handle this? Do you still try to stabilize within the 2 lb limit? Do you do a million steak days to try to achieve it? If not, where DO you find the balance between letting your weight climb up a certain amount before putting on the brakes? I don’t have a straightforward answer for you. The best thing is of course to get your body fat tested hydrostatically – you can look up places to have this done by looking up “hydrostatic body fat test” or “bod pod” in your area. But this is not accessible to many of you. And even if it is, it’s not something you can do every week, so in the meantime, you still have to make judgment calls about whether you are eating properly for your body in phase 3. Because even without exercise, there are often 1-2 lb fluctuations on the scale – phase 3 weight IS volatile because essentially it’s like your body is not used to it’s new weight yet – keeping the carbs and sugars out of the picture during this crucial time allows this process to happen properly. So this is one of my P3 stories involving both exercise and an artificially low LDW that I didn’t know about at the time, because I ate no fruits or grissini on Phase 2 that round. As such you will find this story in both articles. My LDW was 122.8 lbs. Despite doing steak days I found my weight just seemed to want to climb up and I was trying to force it back. I was eating really clean in P3 and doing what I felt was right but still having a lot of trouble. I was starting to get frustrated that my weight didn’t seem to want to stay in one place- this went on for 3 weeks. This was right about the time that I started Crossfit for the first time. You can see here in the photos my gradual weight increases. Finally my wise husband suggested to me that my body was trying build muscle and get stronger and that perhaps I should let it do just that and stop fighting it. It was scary, but even with the steak days my weight was continuing to climb and I couldn’t really do 3 steak days in a row so I didn’t have much choice anyway at this point. Finally I stopped the fasting as I just got the feeling that it was hampering my ability to really improve my strength at crossfit. My weight went up to between 132-135 lbs during this time. The 2 hydrostatic bodyfat tests I did during this time are below- the first one was taken at 124.8 lbs which was my weight 1 week into Phase 3. It said my fat mass was 33.79 lbs and my leans mass 91 lbs. My second body fat test was almost exactly 4 months later, at 132.5 lbs. That day I was 34.33 lbs fat mass and 98.17 lbs lean mass. So that particular weight gain from 124.8lbs to 132.5 lbs, a total of 7.7 lbs, only a half pound of that was fat. That’s it! The rest was all muscle. The month before my 2nd body fat test I didn’t do ANY steak days or fast days. But this is something I really couldn’t have known without the testing. Because no matter how you slice it, fat, muscle, water, more ANYTHING on your body means increased inches. The only way for inches to go down while adding muscle is to also lose fat at the same time, something I wasn’t doing at that point. It’s true that muscle takes up less SPACE than fat, but that’s really hard to actually quantify – all I know is that my pants are all tight. In reality the case is that IF the 7lbs I had gained WAS fat, my measurements would have gone up a lot MORE, but again, I don’t think there’s any way outside of testing to compute inch gains as being muscle or fat. Hi- I love this thread so first of all thank you. When you say that it finally worked out in the end, did your weight ultimately level out or go back down? I’m on P3 now, just started, and am back to my boot camp classes and my weight is rising every day. I am following the P3 diet to a T; no extra snacks, no bad foods, and following a P3 diet plan. I still feel “thin”, clothes are fitting the same in my clothes, but the scale is tipping upwards -just as you describe above. It is a serious head game with this diet. I have another friend who just finished, started working out again and lost more pounds so I’m definitely feeling like I’m doing something wrong. Hey Nancy! No – for my weight to have gone back down I would have either had to lose muscle on purpose and stop working out or stop eating all carbs to get rid of my glycogen stores again – so it was a matter of realizing what the weight was composed of and coming to peace with that and realizing it was was what I wanted – such a weird feeling- guys know the feeling where they WANT to gain weight and mass but for us ladies it’s like a completely foreign concept. I’ve been between 126-130 pretty much for over 5 years now. It IS a head game! But honestly, the good thing is once you really let your process this, you do stop worrying about it. I am SO completely comfortable and confident in my body at the weight it is. And I love my muscle, my workouts, and all of it. It really depends on the state your body is in, the type of exercise being done, how much more weight you vs. the other person has to lose (your body fat percent vs hers), if they are remaining in a glycogen depleted stated – but again remember this is falsely lowering your weight, it’s not the type of weight loss that can last because as soon as you eat 1 potato lol those glycogen stores come back literally overnight. I hope this helps a little! For me to lose additional weight at my current body fat percent – to lose more fat- would be quite difficult and would pretty quickly get to me a level where I don’t actually have enough bodyfat to be healthy for myself – that’s why I say it makes a difference how much bodyfat you have vs another person. Does that make sense? Just food for thought here, but after a couple of rounds fighting this same battle myself and being very frustrated, I found to stabilize in P3 if I stuck to cardio workouts, nothing that focused directly on muscle strengthening just for these 3 weeks it was not so hard. So I settled for a balance of doing just the cardio in P3, nothing too vigorous, and that seemed to help during these three weeks. I am an advocate of combining strength training with cardio for overall health, but for those three weeks I decided to just pass on the weights or muscle tearing workouts and stick with focusing on strengthening just the heart. It was the best compromise I could come up with between worrying about the weight stabilization and not working out at all. I plan to lift weights and do cardio during the whole diet. I have been lifting for a couple years already. I did HCG about 6 years ago. However, I didn’t lift weights. I think I did it too many times. I got down to 110 @ 5’6″and lost muscle. Had not worked out before, during nor after. How was working out during Phase 2? Did you feel tired? Did you need to adjust the amount of HCG. If the scale doesn’t appear to going down, doesn’t your clothes fit looser due to losing fat. Should I be ok on crossfit during phase 3? Also I was only gonna take a 3 week time frame on phase 3 then go right back to phase 1 any thoughts? Is a longer break better? I’ve been doing P3 for about 2 weeks now. I have been around the same weight for most of the time. UNTIL….I started working out again. I do Tabata and T25 workouts. I also am a fan of Circuit training (ie with Jillian Michaels). I enjoy full body workouts (interval training with some cardio). I found that I am now having a hard time keeping within the 2 lbs of my LIW. This is so painfully frustrating. I am reading from our sweet HCGChica’s blogs that this is normal because of the water retention for muscle repair. Nonetheless, it’s quite disconcerting. I’m thinking of not working out as hard in P3 and certainly not work out in the evenings when my body doesn’t have enough time to deal with the water retention. I think I may need to begin over again. Any thoughts would be most appreciated. I’m very excited to be a part of the discussions on this website and very thankful! I’m going to be done with P3 in two days. My weight has never gone over the LIW except for one day only it was 0.4 above it but corrected the next day. The rest of the time my weight has stayed below and has for the most part stayed with 1 to 1.5 lbs below my LIW. I’m eating around 1700-1800+ calories a day, height is 5’7″ 185 lbs and I’m extremely nervous for P4. Since my weight has been inside the magical 2 lb range for the 21 days should I consider it stabilized? I plan on only doing 1 starch a day at first and trying different ones to see if I react. Any ideas about which starches are good ones to begin back into? Started P3 a few days ago. Finding it hard to get to 1200 calories a day. What is the average amount others have eaten for meat(ounces) and vegfruits(cups)? Hi @disqus_UA9toeTFV1:disqus – I don’t know specifics like that unfortunately but eating to hunger is really the best policy on that so that you will eat what your unique body is needing at any given time. No need to eat more than your hungry for- you will probably find that your hunger/calories gradually go up as P3 progresses and you readjust to eating normal amounts of food again. Thanks I will make sure I have food available while at work when I do get hungry. I’m so worried about not eating enough and having my body go into starvation mode and have the weight come back. I’m still 2.3 lbs below my last injection weight but it has only been six days since it and I’ve gained 1 lb in the last two days so I was getting nervous. I’m planning on increasing my protein ounces of meat, basically double of P2 amount and same for the vegetables. This way it will help get me closer to the 1200 I should be at. Where can I find a protien shake or meal replacement without sugar? Hey @cheriethinn:disqus sorry I missed this – there are actually tons of protein powders with no sugar – in fact I just recently asked my FB page peeps what their favorite brands were – here’s the thread with lots of good choices: https://www.facebook.com/gohcgdiet/posts/722916261096672 I hope that helps! I love Dr. Mercola’s Pure Protein Powder. I purchase at my doctor’s office but it is also available on AMAZON: http://www.amazon.com/Mercola-Vanilla-Pure-Power-Protein/dp/B004ZMD5TM/ref=sr_1_1?ie=UTF8&qid=1417739018&sr=8-1&keywords=mercola+pure+protein+powder … I hope this helps! It’s yummy! You speak often of body fat testing. What are your thoughts on the handheld bio-impedance devices? Are they useful, a dud, or somewhere in between? If someone doesn’t have access to regular BodPod or hydrostatic body weighing, are these a reasonable compromise? Hey @disqus_IrS8P552AA:disqus – this is what I can tell you about the body fat monitors- I have a handheld one called the Omron Body Fat monitor- when I was more overweight, it was actually very accurate when compared to my hydrostatic results- within 1% actually- so it was quite useful my first three rounds- however, after I got to a certain point of leanness, it was no longer accurate and overesimtated my body fat by 4-7% compared to hydro testing- so from my experience, it seems to be a useful tool while you’re still fairly overweight, but as you get leaner, for whatever reason I don’t know, it is no longer a good tool to use. The hard thing of course is that without hydro or bod pod. you can be sure when you reach that point- but definitely my first 40 lbs of weight loss it was definitely fairly reliable. As far as the scale body fat monitors go, I haven’t used those, so I can’t be sure. I hope that helps a little. I do wish hydro and body pod was more accessible- even for me since I’ve moved, I now have to drive like 2 hours to get it done so I’m not able to do it as much as I’d like anymore either. DEXA scan is the other thing you can check into that’s extremely accurate, but would be more pricey. There is a hydrostatic weighing facility about 40 minutes from me. 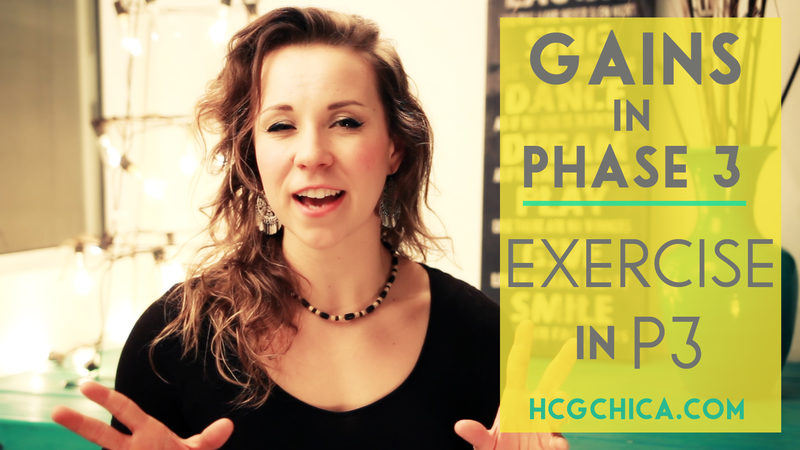 What kind of timing would you recommend for the testing around hCG rounds? I mean, how soon after finishing P2 is it advisable to do it to check on results? Another question: if you do hydrostatic, what is the best time to do it? How long after finishing P2 is a good time to get an accurate reading? Hiya! @disqus_IrS8P552AA:disqus Ideally you want to be tested in the morning- most accurate- and I’d also advice waiting to do the test until it’s been a week or two into P3 so that any glycogen stores you lost will be refilled (ie you might go up a few lbs but this may be glycogen which will be registering as muscle in the test). I hope that helps! I hope you’ll share you’re results with me!